Springtime arrived early in the Caribbean this year, and we'd heard that several of the resorts were flowering faster than the island hibiscus. 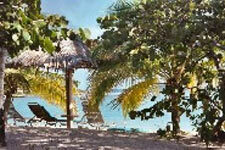 Little Dix Bay on Virgin Gorda had a new spa and a new executive chef. 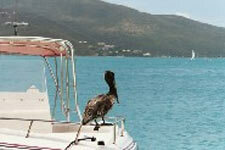 Caneel Bay on St. John had added a Self Centre and Peter Island Resort had a nature tour we'd never taken. The St. Thomas' Ritz Carlton had several new Club rooms, and we'd heard the Westin on St. John had a new "Heavenly" program. This we had to see. We flew from Providence to St. Thomas (with a smooth transfer in Philadelphia) and arrived in the tropics during a light spring rain. We’d planned to continue on to Virgin Gorda on an Air Sunshine evening flight, but a front was due to move into the area, and the airline had actually held the afternoon flight for us. We boarded the small plane a couple of hours ahead of our schedule and took off under gray skies. From the air the Virgin Islands lay strewn before us like gray-green boulders surrounded by blue foam. The nine-passenger plane made the hop to gorgeous Virgin Gorda in less than 20 minutes, and we cleared customs and immigration at the one-hut Virgin Gorda International Airport. Little Dix Resort has a booth located just outside of immigration, and several friendly staff members were on hand to greet us and complete our check in formalities, after which they escorted us to the resort. The light rain turned into a tropical downpour en route, and we were glad we’d caught the early flight. Once we arrived at Little Dix we were assigned identical ocean view rooms with no television, yeah! The rain had taken the heat out of the day and we both turned off the air conditionings in our rooms and opened the windows to the gentle sound of rolling surf. When the showers stopped, we took a walk through the gardens down to the beach to watch the spring tide rolling in. Three small, uninhabited islands appeared to the north. The stretch of empty beach before us seemed to reflect these distance empty shores. By the time we finished our walk, the horizon had darkened with another approaching shower. Indeed, by dinnertime it was raining again. The Little Dix General Manager and his wife joined us at the Sugar Mill for cocktails, but the evening wind began to blow rain through the open room. We moved our party to the Pavilion Restaurant, where we both opted for fresh fish – Michael had the catch-of-the-day grilled Wahoo while Severine had a delicious Red Snapper. The meal was good enough to drive the rain away! Looking back, dinner the first night was a forecast of what was to come – the fresh grilled fish was the first of several absolutely outstanding meals at Little Dix. After the full day of travel and the excellent dinner, Michael fell asleep watching the ceiling fan revolve slowly overhead. Raindrops dancing on the roof woke him once during the night, but he drifted back to sleep listening to the peaceful sound of the waves. The next morning the rain had abated, and we met up for a short stroll on the beach before making our way to the Pavilion for a delicious buffet breakfast. The French baguettes dipped in batter and lightly toasted, then drizzled with syrup were extremely popular (and extremely delicious!). The buffet included a couple of signature items such as poached eggs with tomatoes, asparagus and spinach, original and also delicious. Michael was especially happy to discover traditional British breakfast sausages on the buffet. Exceptional in style and flavor, he said they were just like those from the "old country" and quite a find so far from home. We took a tour of the resort after breakfast. 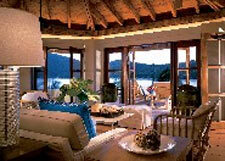 The property is laid out around Little Dix Bay and takes full advantage of the natural curves of the inlet. From the beach it is hard to see how many rooms there are, nestled as they are in the thick foliage near the beach. Laurence Rockefeller bought the property around Little Dix Bay and built the resort in 1964. At the time he wanted to create a hide-away for family and friends. Today the resort is still a favorite of wealthy and influential clients who call the place home for some part of each year. After our tour we set out to explore the far corners of Virgin Gorda. We took a cab west across the island, followed by short ferry ride for a quick tour of Biras Creek, then hopped on another ferry for a short ride to the Bitter End Yacht Club. The Bitter End is a favorite gathering spot for sailors throughout the Caribbean, and a stop here is anything but bitter, although it might be the “end” because visitors seldom want to leave. 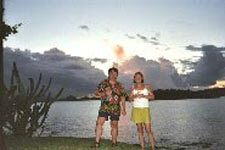 The club has a light-hearted, laid-back atmosphere, with a mix of colorful characters and vacationing families. The only access to the resort is by boat, and half of the rooms do not have air-conditioning - the trade winds are so steady one might never need more than a fan. (AC is available for those who want it.) Telephones have been added to the rooms since our last visit, but (thankfully) no televisions have been added, although a common gathering room has cable TV and videos. The staff loves this place, and several have worked here for more than 30 years.